ABOVE  Kevin Daffe, winner of the freestyle event, is thrown into the air. Carl Yastrzemski of the Boston Red Sox won baseballs triple crown in 1967 when he led the league in batting average (.326), home runs (44) and RBIs (121). By winning the Kentucky Derby, Belmont and Preakness, Affirmed earned horse racings triple crown honour in 1978. At Wednesdays eighth annual Whitewater Rodeo, Kevin Daffe won theYukon kayaking version of the triple crown, sweeping all three major events  the slalom, freestyle and down river race. I was surprised that I won the slalom. I had a little side bet going with my dad (Bob Daffe). Hes beat me every other year and theres a lot of good paddlers at the rodeo that gave me a good run, said the 18-year-old. In the slalom, held in the Yukon River rapids just below the dam, Daffe fought through the waves to manoeuvre through several gates, narrowly beating his father for first place. In freestyle, Daffe managed to pop and spin and perform enough tricks with his kayak to earn 370 points to outdo Jody Schick (365 points). 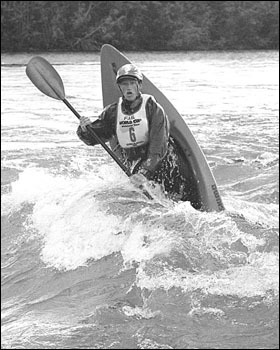 The final event, a one-kilometre down river race from the dam to the old intake, Daffes superior paddle power allowed him to finish 10 seconds ahead of Yannick Bedard with a time of two minutes 54 seconds. The secret to Daffes all-around kayaking skills stems from a life on the water. His dad runs a canoe/kayak rafting company (Tatshenshini Expediting) and the younger Daffe has been in a boat since he was a kid. Ive been paddling for so long, since I was eight, so I get quite comfortable in the boat. I really have a nice play boat and I go out and have a good time, Daffe said. Collecting first-place honours isnt paramount at this competition. For most kayakers and canoeists, having a good time is just as important as a good finish. Jody Schick, who competed at the 1997 world canoe and kayak championships on the Ottawa River, enjoys the low-key atmosphere of the Whitehorse event. A crowd of about 200 people gathered on shore to watch the enders and rolls while music blared and two commentators gave a play-by-play and handed out prizes. Its such a colourful and exciting sport. Its fun, invigorating and kind of risky and I know people like watching that, Beebe said.